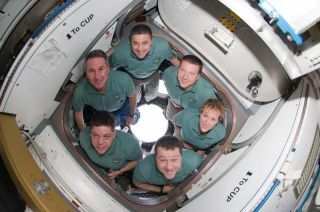 The STS-130 crew poses for a portrait in the newly-installed Cupola of the International Space Station while space shuttle Endeavour is docked. Pictured clockwise (from the top) are NASA astronauts George Zamka, commander; Terry Virts, pilot; Kathryn Hire, Nicholas Patrick, Robert Behnken and Stephen Robinson, all mission specialists. The photo was taken Feb. 18, 2010.